JWOC is not all play! 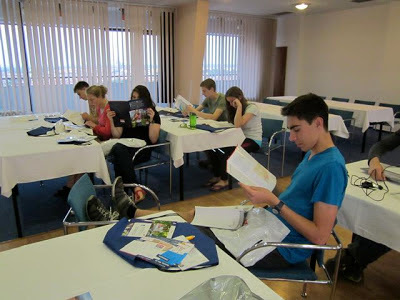 Here the team is studying the event bulletin on Friday night. Lots of details to go through! Saturday morning we drove to Kutna Hora, about an hour's drive from Hradec Kralove, for a bit of sprint training and sightseeing. Kutna Hora is a UNESCO World Heritage site and an old city with narrow cobble stone streets and massive cathedrals and buildings. The official JWOC Opening Ceremony is also scheduled for Sunday afternoon. From 2-3 ~ left or right?? I think the right route from 7-8 is faster ~ do you agree? 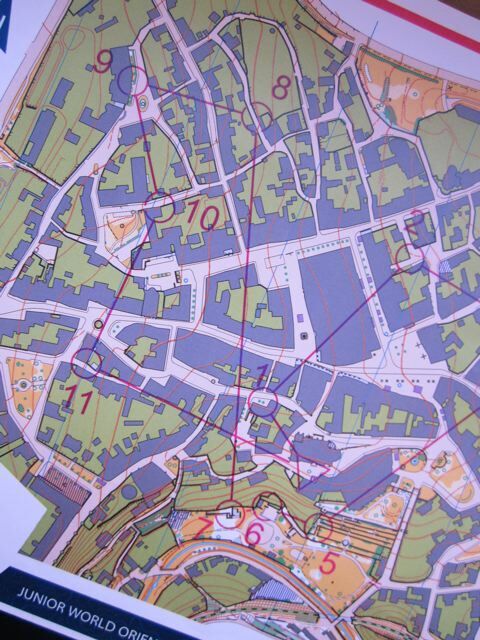 The sprint training gave some tricky route choices on the winding cobblestone streets. "Thank God the sprint has only 15m climb and not 60m because that is hard running up cobble stone streets"
After the sprint we walked up to the cathedral and then had lunch and another bit of wandering around the streets to get a closer look at the places we had run by earlier. Tomorrow is a rest day for everyone to recharge their batteries before the long distance on Monday. JWOC ~ More Long & Middle Training! 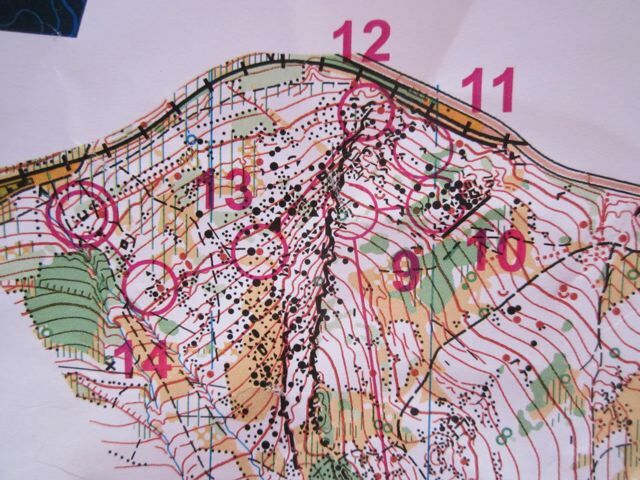 In the afternoon, the Team headed on over to the second middle training map, Chvalecsky Les, and run a short course. 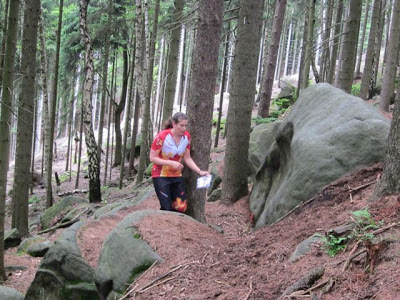 The end of the course went through a very rocky area with giant boulders and cliffs. Very tricky! The tunnel under a railway led to the middle terrain! Everyone had a good day of training. 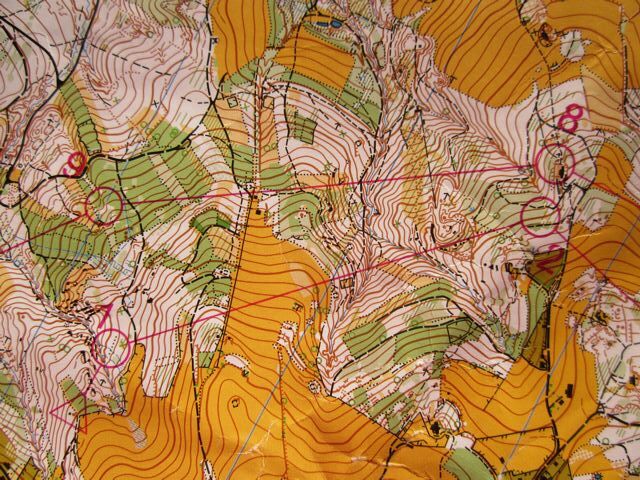 The long training was an opportunity to practice good route choice analysis and learning, while the middle terrain was a reminder of how careful you have to be among all the details on the map! Back at the hotel in Hradec Kralove, the JWOC event centre is now open, with flags and posters all over the hotel lobby! The Team picked up their accreditation badges and bags of information. The next two days will be mostly rest before the first race on Monday. Tomorrow will start with a short sprint practice in the morning, and then some sightseeing. Stay tuned to the Team Canada blog for all the behind-the-scenes action, as our Canadian athletes count down to the first race on Monday - the long distance! You can also follow us on Facebook and Twitter. You can catch all the JWOC action on their website, and also on Facebook. Today, the JWOC team concentrated on Long and Middle distance model training. First up was the long distance map, at a 1:15,000 scale. 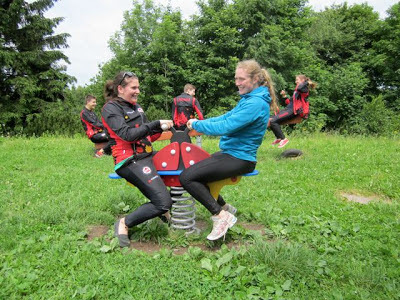 The group started at a restaurant and viewing tower on a hill top, Jiraskova Chata. Start of the long training. Tough route choice legs. Which way would you have chosen from 8 to 9? Afterwards the team had a packed lunch and time for some relaxation before moving on to the afternoon session on middle distance map. Jennifer tackling a steep hill! Today's training for the long is physically really challenging. I think it came as a bit of a surprise to everyone that the running in the white forest was faster than running in yellow, due to long grass. Also, the woods were more tick free! The mental approach to the middle and long terrain is quite different. 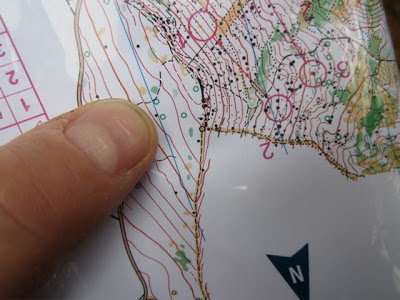 In the long, one must struggle to read through closely packed contours to plan ahead. In contrast, the middle involved intense concentration on the terrain underfoot. It was easy to ignore the "rocky ground" on the map but unwise to forget the mossy mess attempting to trip you up. Crossing the Polish border on both maps was really fun. Man I am going to have a great bum after all this hill climbing! The long will involve climb. I plan to RISE to the challenge. I have never seen such clean forest under my feet. The Polish border looked a lot more open than the Czech side. Of course, that may have been because it wasn't mapped. The difference between a distinct tree and a non-distinct tree here is that one is a bit bigger than the other but that doesn't make a world of difference in dark green vegetation. It's like learning to orienteer all over again in these areas and the way they're mapped. Where is this vegetation boundary they speak of? The long terrain is very hilly making route choice very important, trying to get a balance of as little climb and distance as possible. Les terrains de la longue distance resemblent un peut aux terrains de Saint-Etienne ou Emily s'entraine. Les terrains de la moyenne sont vraiment sympas, c'est tres agreable de courir sur des terrains difficile techniquement avec de nombreux rochers. Le temps etait ensoleile, en esperant que cela continue. Looking forward to the long and all that climb, well not the climb exactly, but I seem to be dealing with the route choice and long terrain better than the rocks, rocks, rocks and individual trees (which one are they!?) of the middle. Today I got a lesson on how to descend quickly from a herd of wild goats. Sounds like they're having a good time, at least! Stay tuned to the Team Canada blog for all the behind-the-scenes action, as our Canadian athletes prepare for competition next week! You can also follow us on Facebook and Twitter. You can catch all the JWOC action on their website, and also on Facebook. 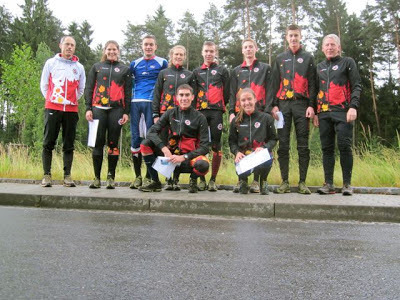 The Junior World Orienteering Championships (JWOC) start this weekend in Hradec Kralove, Czech Republic. All the Team Canada athletes and support crew arrived by Tuesday evening, ready for a week of preparation training and acclimatization. Our athletes this year are a mix of first-time and seasoned JWOC athletes. Our athletes this year are Adam Woods, Trevor Bray, Alex Bergstrom, Robbie Graham, Pia Blake, Kendra Murray, and Jennifer MacKeigan. Injuries have plagued the junior team this year. Molly Kemp was offered a spot on the team, but she declined due to ongoing injury. National Junior HPP Coach, Brent Langbakk is currently injured, and was unable to accompany the team to Europe. Brian Graham stepped up last minute to fill the coaching role ~ thanks Brian! Brent and Molly, get well soon. We hope to see you both in Europe next year! Today, Wednesday, the team went out for a short jog around the city to shake out their traveling legs. This afternoon, the team did some training on the model map for the relay. With them was guest member Remi Baudot from St.Etienne in France (pictured in blue below). 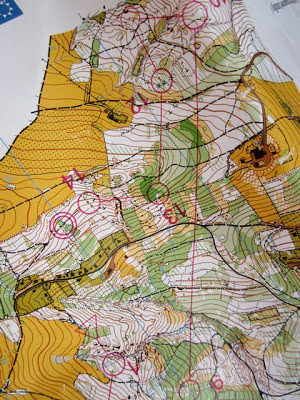 The training was in a flat area with lots of trails, ditches and vegetation features. When asked what she took away from this training, Pia said, "We have to learn what is mapped as distinct trees in the middle of a green area. It was usually large oak trees in otherwise coniferous forest." Adam found it to be a challenge with the shades of green and vegetation boundaries, but had lots of fun. The forest was wet, and ditches filled with water after several days of rain. The team is hoping for drier weather in the coming days. Here the team is ready for training. What do you think of the new Team Canada outfits?? I have just gotten “home” (i.e., to Uppsala) from Tallinn O Week, which was all together terrific, and offered some very diverse races. As the name suggests, it was a week-long (Monday–Saturday) event in and around Tallinn, the capital of Estonia. 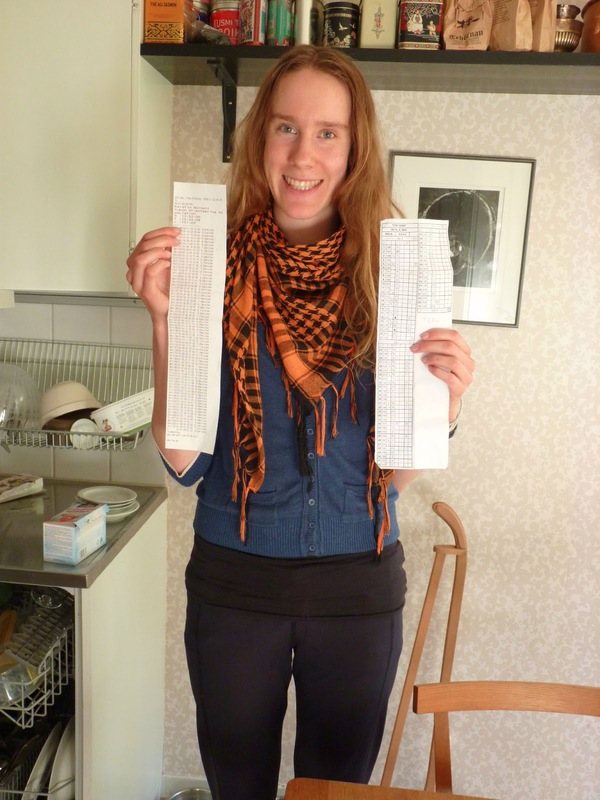 I met up with fellow Canadian Jennie Anderson (from Orienteering Ottawa) and we stayed in a hostel right in downtown Tallinn, with a bunch of other orienteers from around the world. We jumped right in to the week with a World Ranking Event (WRE) in Kadrioru Park, which includes the president’s palace and an art museum that’s surrounded by a labyrinth of ramps and walls (=traps!). 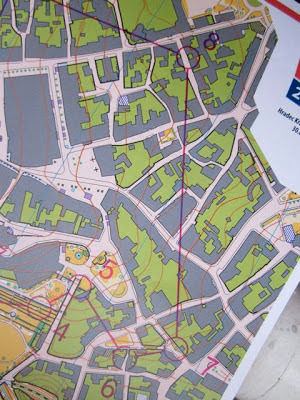 This race was a blast, with fast running and tricky navigation around the aforementioned walls. Perhaps my favourite race of the week (or at least the one that most exceeded expectations) was the “City Race” through the cobblestone streets of the medieval old town. 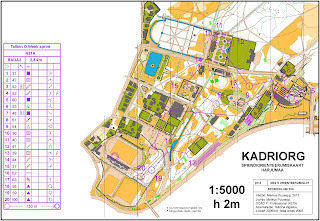 We used a sprint map (1:4000, ISSOM) but with distances and winning times for a middle. I thought that sprint-style navigation would be too easy at a slower, middle-distance pace, but I was wrong. 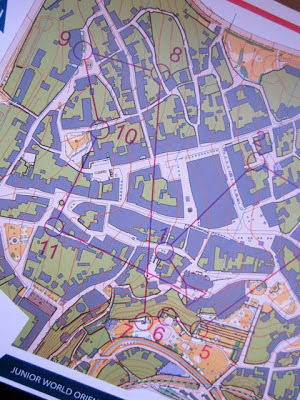 The course was jam-packed with challenging route choices and the narrow, crooked streets did not permit any lapses in concentration. I had a few unnecessary hooks and curves, some small mistakes (ex: missed the passageway to control 2), and at one point I almost ran inside a restaurant by mistake, but overall I was happy with how it went. I tried to choose smooth routes, ones without too many zig-zags and with gentle slopes instead of steep stairs. Stairs slow me down a lot, whether I am going up or down them, and they make it very hard to read my map. An example of this is leg 6, where I took a slightly longer route but I was able to run the whole way and got a chance to read ahead. Jennie took the stairs instead, and says they were gruelling. Check out my route here: http://www.lsf.ee/Tulemused/RG/cgi-bin/reitti.cgi?act=map&id=136&kieli=en (class N21A). Which routes would you have chosen? This race was fun not only because of the technical challenge, but also because it was exciting to run among centuries-old buildings and confused tourists. The pointed stone towers of the city walls look like something from a fairy tale, and all the restaurant greeters are dressed in medieval costumes. Since this was an informal race, I decided to do a shorter course to rest up for Friday’s WRE. I chose to run women’s 21C, and quickly discovered that it was not only shorter than 21A, but also simpler, with trails to follow the whole way. My day’s goal had been to visualize each control feature, so the easy navigation allowed me to focus almost solely on that, and it ended up being a good training exercise. After the thick forest on Tuesday, it was exhilarating to speed through some open, sandy pine forest. The Tallinn O Week final was not a typical long-distance race. It was called the “100 CP” – yes, as in 100 control points. Only the men’s elite course actually had a full 100 controls, but my course (elite women) had 70, which was plenty! At 9.5 km, that’s an average of one control every 136m. As you might guess, it took a lot of concentration. A few times my thumb slipped from its place and I had to search for my spot again. Towards the end, the control codes and control numbers were all starting to blend together. To make things even more interesting, controls 24-52 were on a separate map (printed on the back side of our normal map), which was 1:5000 and contours (and marshes) only. Our control descriptions did not fit in one column. 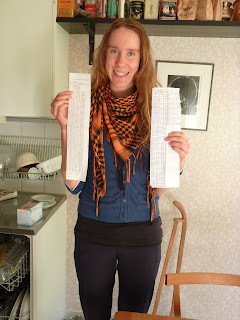 Besides all the fantastic orienteering, we also got a chance to do normal-tourist stuff. 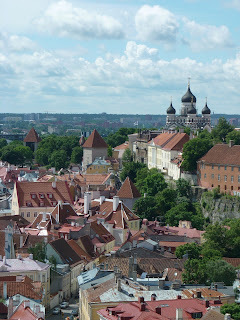 Jennie and I spent several days happily exploring the old town and going to museums. It’s a beautiful place, and I really enjoyed the whole trip. 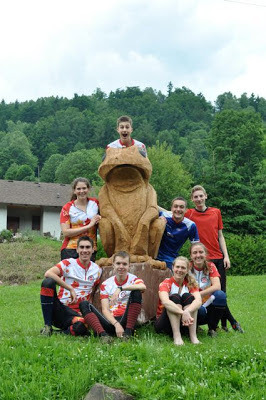 JWOC Interview #3: Hodně štěstí (or for those that don't know Czech, good luck)! 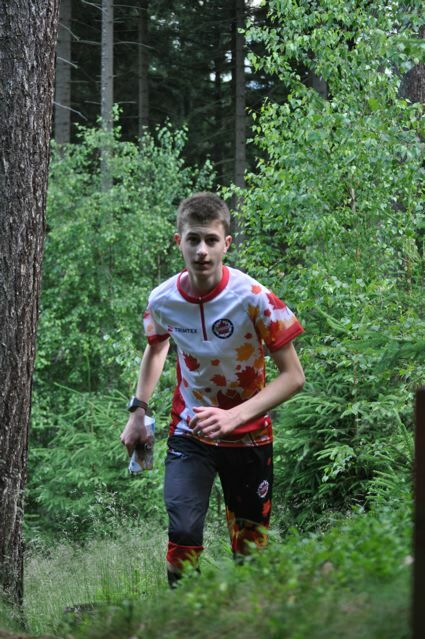 It’s now just over a week before JWOC, so here is the last instalment of the pre-JWOC interviews. Be sure to check back in the coming two weeks to get updates from the team as they train and compete. 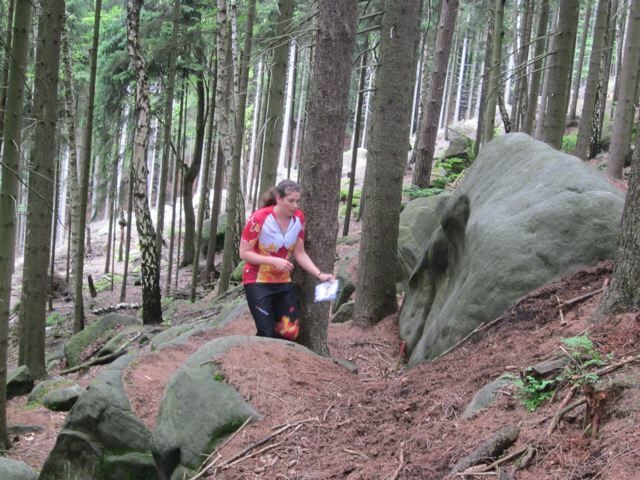 You can also check the JWOC website for results once the races start. What are your goals for this JWOC? Any words of wisdom to up and coming juniors who may like to attend JWOC in the future? What is one of your favorite motivational songs? We wish all the Canadian athletes competing at JWOC the best of luck. We’re cheering for you! And thank you to all the coaches, parents, supporters, organizers, friends and many more who have helped helped our athletes along the way. After taking a week off school for the HPP training camp in Cranbrook, I attended Barebones in Canmore. It was a great weekend full of types of races that I had never heard of before. I got to Canmore on the Thursday evening and stayed at the beautiful Alpine Club since I would be staying there for the Family Camp (and I am so thankful for being able to be a part of that at the last minute, as well as to those who gave me rides to and from Canmore and the individual races). Friday was a relaxing day spent watching movies until the Urban-O. One of the perks of deciding not to bring a laptop or an ipod charger was that I did pretty much no homework (and I’ve only just caught up, but that was mostly due to things I had been procrastinating on before my week off) and spent most of my free time reading. In the evening was the Urban-O in downtown Canmore. It was based off of the game Clue (which I have never played). I’ll try to explain it, but it may get confusing. There were eight “rooms”, which were areas on the map in which you could “suggest” to other players who committed the crime and with which weapon in the room you are currently in (unless you were suggesting to one of the “townsfolk” - aka volunteers, then you could suggest it was committed in any room). If the person you were suggesting to had a card (two of which each person received at the beginning – there are no cards for the elements of the crime committed), that person would have to show you only one (townsfolk would show all cards disproving) of their cards disproving your suggestion. I was glad that one of the cards I got was for a room that was kind of out of the way, so I knew I didn't have to go there, but I still spent a fair bit of time running to other rooms because there were so many that I hadn’t disproved. We had an hour to try and figure out the specifics of the crime before heading to the start/finish and making an accusation. I, and I think most people, just guessed, but several people/teams did get it right. I liked the event because it was fun trying to figure it out without the pressure/disappointment of feeling that it was unlikely. On Saturday were the Setup, the Chase, and the THOMASS events. The setup was a sprint style (my race was 1.7km) event in Canmore for which the times were used to arrange the start for the Chase. Just before the start, I was told that the finish would be my second last control because there was a mother elk and her calf near the finish. My race went well, which was nice after a week of being challenged. Then, after noon, was the Chase event at the Canmore Nordic Centre (which was a busy place that day with both a running and a biking event taking place as well as the orienteering, but at least those were wrapped up by the time the THOMASS event started). With some exceptions, start times were 12:00 plus an individual’s time for the Setup. 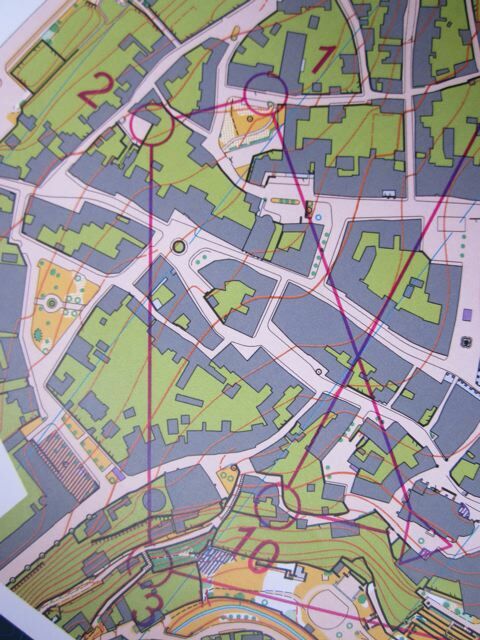 I believe the Chase was intended to be a middle style event (but being on course three, my race was only 1.9km). For me, it was an alright race, with a couple mistakes – thankfully the it-just-takes-longer type of mistakes and not the wandering-for-ten-plus-minutes mistakes that I sometimes make. Then we had lunch and awards (cookie medalsJ) in the Nordic Centre. Then there was the THOMASS, for which people were designated a handicap based on age and experience. This handicap determined how many controls you needed to do on the first side of the map before going to the finish (for that side) and flipping over the map for a 2.9km point-to-point course. I had to do four of the seven controls (#s 3,2,5, and 4 if you want to check them out at http://barebones.ca/Barebones%202013/THOMASS%20-%20both.pdf ), which was a good amount for me, especially considering the placement of the controls – I didn’t have to go to any far off ones. For the point-to-point portion, there were usually other people around the whole time, which I found made me really focus on my route choice compared to what others were doing. Thankfully, this worked out well for me, rather than distracting me too much, like in the case from control six to seven. As I was arriving at control six, I saw one person ahead of me heading to control seven one way, and another person another way. This caused me to see the higher trail, which I’m glad I took, versus the lower trail, in which case I would have had to climb back up. I quite enjoyed the THOMASS because of this and the controls in general. In the evening there were speakers at the Alpine Club. Graeme Rennie spoke about his past JWOC experiences and Alix, Emma, and Darya spoke about orienteering in Switzerland last year. The presentations were good and reinforced a personal desire to go to Europe, both in general and for orienteering specifically. There was a large selection of dessert afterwards – there was always lots of great food at the Family Camp, always a highlight for any trip I take. On Sunday was the Farsta (one-man relay) at Mt. Laurie. For those of us on the long course, there were three loops, each about 2km. Not everyone started on the same course, so it was interesting to see the stream of us start to branch off. 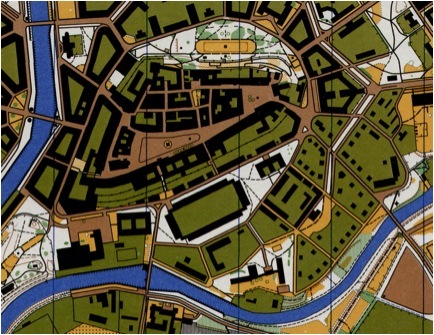 The maps were on a 1:7,500 scale, which was nice with the amount of contour detail on the map. It also probably helped make sure I didn’t have a race like last year at Mt. Laurie (but at least I knew I couldn’t possibly do as horribly as then). Generally, the race went well for me, with once again only a couple mistakes, plus a bit of lost time due to neglecting my compass and circling around while heading to the finish. The weather, though, was interesting. Partway through, I got soaked. I also had issues with my glasses falling off while I wasn’t wearing them, so I dropped them just past the control between loops, which I quickly regretted, worrying that someone would step on them – but they were safe when I finished. Yet near the end of the race I could have used them, although it wasn’t awfully bright. I liked this race because I got familiar with the terrain and specific areas of the course of my three loops, which boosted my confidence. Overall, it was a great weekend, full of lots of orienteering and fun. On the way home, I finished yet another book, like the antisocial creature I am, before returning to a “normal” life consisting of the last homework assignments/projects of my high school career! JWOC is in two weeks! Our athletes are now in their final preparations. But it's important to remember that they've put a lot of time and effort in the many months before JWOC to train. In this week's installment of the JWOC athlete interviews, I asked them about their training over this past year. How has your training gone so far this year? 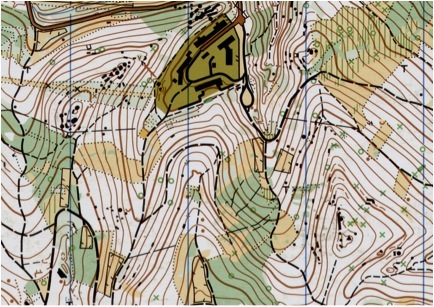 How would you describe the expected terrain and potential strategies to orienteer well in this terrain? 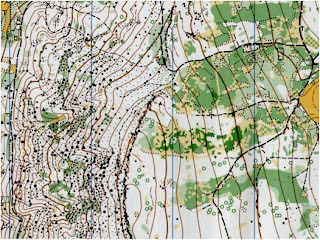 You can find full map samples for the JWOC maps here. 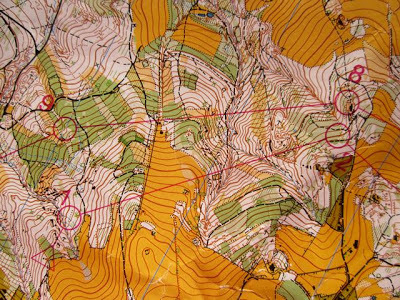 Is there anything you have done to train particularly for this terrain? So I arrived back the Tuesday at midnight after 19 hours of travel, had a work orientation at 8 am for the next two days and then travel out to the camp. Needless to say I was a tad tired at the camp; ok that’s an understatement, I was completely physically and emotionally exhausted (as only working in a third world medical system can do to you) BUT I think I was able to get benefit out of the camp non-the-less! The terrain at McQueen Lake thankfully involves some areas of open running with hills and clumps of trees (nice big features for me to navigate off) and it was great to be back on a map! There were, however, areas with less enormous features, and the fact that I hadn’t been on an orienteering map since sprint camp became painfully obvious at those points! This camp served as reinforcement to me around the complexities of this sport; it is not like a track workout where you can just show up in body and hope that you will get some benefit. Your mind needs also to be present and able to concentrate. By the Monday morning when I was doing (for by this point you cannot call what I was doing running) the last training exercise I found myself continuously getting distracted by the approaching start of my ‘grown up job’ (nursing on an orthopedic surgical floor, my first shift being that night at 7 pm – again great planning Tori), and my RN licensing exam, which I was running out of days to study for... It reinforced to me what coaches have been saying for years (namely Brent..) about the importance of having the ability to refocus (i.e. 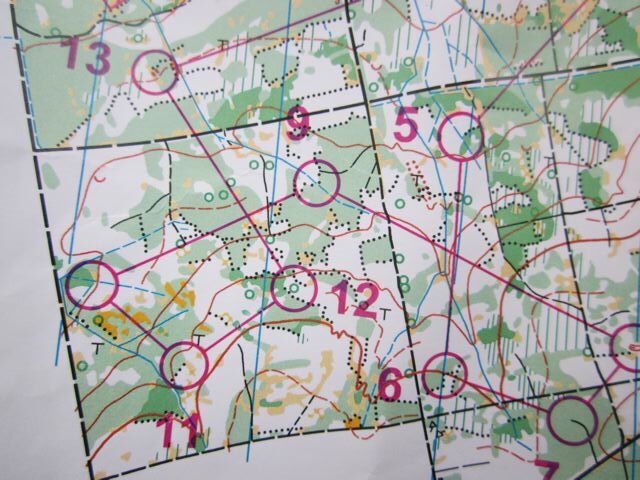 with a focus word) so that as an athlete you are able to bring your focus back to the map, compass and your race. It won’t always be outside the sport things that are stressful, the pressure of a big race or competition itself can be distracting. It is something that I plan on working on now that I have a bit more spare time! For the past three years, my June has been filled with the excitement of the upcoming Junior World Orienteering Championships (JWOC). 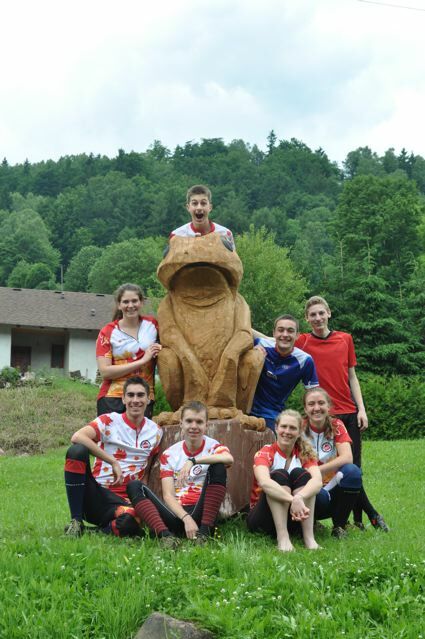 While unfortunately I am now too old to attend JWOC, I am excited to watch (from afar) our junior team compete in the Czech Republic this July! This year our junior team is: Alexander Bergstrom, Trevor Bray, Robert Graham, Adam Woods, Pia Blake, Jennifer MacKeigan, and Kendra Murray. You can view their HPP athlete profiles here! In order to get us excited to cheer them on, I asked our athletes a few questions. 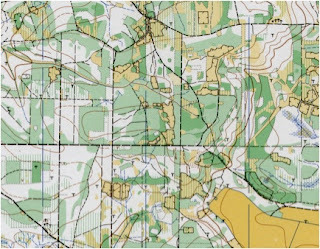 Over the next few weeks I’ll be posting their answers, so be sure to check back for the latest junior orienteering news! Today's questions are on what they're looking forward to. What is your favorite part of JWOC (for athletes who have been previously)? What are you looking forward to most at JWOC? The next post will feature questions about their training for this year to prepare for their races. 2013 Canada Cup Series Starts With A Bang! In an event filled weekend, Sage Stomp hosted the first Canada Cup of 2013. This long distance race was held at McQueen Lake near Kamloops. The open grassland area challenges all runners, even those who have visited the area in the past. Damian Konotopetz of Manitoba ran a strong race, beating second place Will Critchley by only 6 seconds! Eric Bone of Team USA came in 1:02 behind Will for a close 3rd place (Eric is not eligible for Canada Cup points). 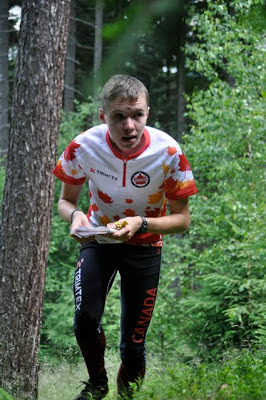 The 3rd place Canadian was junior team member, Adam Woods. Congratulations to Damian, Will, Eric, and Adam for each running an impressive race! On the women's side there was a small field of only 4 runners. Vancouver's Louise Oram gave a convincing win, over 18 minutes ahead of second place Catherine Hoofd. Jackie Bonn of Kamloops came in 3rd, with Tori Owen of Calgary in 4th place. In the Best Club in Canada category, GVOC holds its top spot after the first race, with 58 points, ahead of Coureurs de Bois with 25 points! Here's the link to the full, official standings. You can view the results and splits on WinSplits! There are also some photos up on the GVOC Facebook page.